The SIR program is run by the general manager, 16 full time staff and about 70 seasonal staff. Melissa is the General Manager of the SIR program. Melissa enjoys working for SIR because she loves the wide range of people she gets to work with. Fruit growers, industry representatives, elected officials, scientists and community members, each have a role to play in the program’s success and each bring their own expertise to the table. Melissa comes from a family of grain and cattle farmers up in the Peace Country. She has been working with Okanagan local governments since 2010 and began working for SIR in 2014. Melissa has Bachelor degrees in Science and Education and a Masters in Biology, studying turtles in the Okanagan. Melissa spends her free time raising a young family and tending to her own (closely managed!) fruit trees. Paul is our Field Operations Manager. Paul is responsible for the day to day operations of the field offices, field supervisors and field staff. He started with SIR in 2015, coming to the program with an extensive background in information technology and management. He has previously worked in health care, private industry and local government. 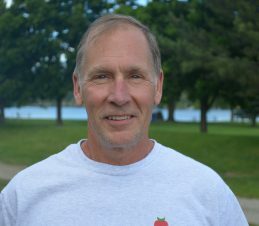 Paul is passionate about the SIR program because “reducing the amount of pesticides used for the codling moth and reducing codling moth damage is vital to our whole community.” In his free time Paul enjoys open water swimming, biking and working with honey bees to provide orchard pollination. Evan is passionate about bugs (and all things creepy-crawly)! He studied Entomology at the University of Alberta, where he completed a Master of Science. He previously worked at the Centre for Agricultural Biology in Switzerland and is currently working to become a Professional Agrologist (PAg). Evan started with SIR in 2015 and his work involves collaboration and coordination with other scientific and government organizations. With his background in science and data analysis he helps translate difficult to understand information into practice. Evan is working towards being a fruit tree pest management advisor and offering extension services through SIR. 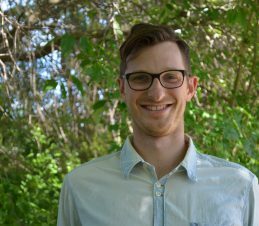 Having grown up in the Prairies, Evan is amazed at what is able to grow in the Okanagan and loves getting his hands dirty in the garden, nurturing vegetables and flowers. 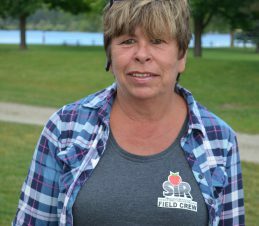 Kelly enjoys working for SIR because the program benefits all people in the valley, residents and growers alike, by reducing the use of pesticides and helping produce better quality fruit. In Kelly’s spare time she likes to head to the woods on her ATV to escape the rat race. 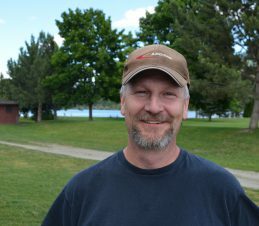 Shawn helps keep the everyday field operations running smoothly in Kelowna during the field season. Shawn is also responsible for much of the GIS mapping including the Neighbourhood Maps produced for growers. Shawn was born and raised in the North Okanagan. He is a Registered Professional Biologist (RPBio) with a biology degree from the University of Victoria. Shawn likes working for SIR because with a variety of tasks and challenges there is rarely a dull day! In his free time, Shawn enjoys camping, spending time with family, and an occasional craft beer. Sharon started with the SIR Program in 2000. 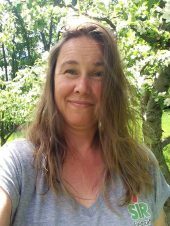 She is an expert in both urban and orchard tree care and brings her years of knowledge and understanding to each residential property in her role as Urban Supervisor. Sharon enjoys working with home owners, and her ability to communicate clearly and kindly has helped her be successful. As Urban Supervisor Sharon helps growers by keeping urban sites clean so they will not have an impact on the orchards in the area. Sharon enjoys working for SIR because it is an environmentally safe pest management program, and that’s an easy thing to help homeowners understand. In her spare time Sharon loves to garden, go camping and spending time with her family. Nicole started with the SIR program as an urban and orchard monitor in 2006. She is now the Seasonal Field Supervisor for the Vernon to Salmon Arm area. Nicole spends her days out in the field overseeing both orchard and urban properties to ensure growers and homeowners are controlling codling moth infestation and keeping their host trees in good care. This helps to ensure they are receiving the full benefits that the program provides. In her spare time, Nicole loves spending time with family and friends, boating and reading. 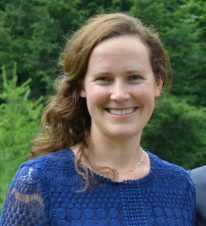 Alexis joined OKSIR in March 2018 as Field Supervisor for the Okanagan Falls to Summerland area. Having grown up on an orchard in Summerland, Alexis has always had a passion for the environment, wildlife and outdoors and as a result obtained her Bachelor of Science Degree from UBC with a major in Ecology & Evolutionary Biology. 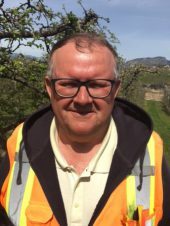 Bruce is a Field Supervisor for the Oliver, Osoyoos and Similkameen areas. 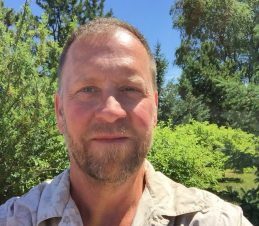 Bruce has lived in the South Okanagan most of his life and began his career working in the forestry industry. Bruce has been working for the SIR program since 1995. 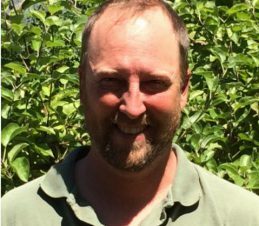 He has extensive experience with all area of field operations and has done a number of jobs for the program including working in the moth rearing facility in Osoyoos, releasing moths in orchards, trapping, communicating with growers, ATV maintenance and training staff. During his many years with the SIR Program, Bruce enjoys being out in the orchards in the beautiful South Okanagan valley best. In his personal time, Bruce loves exploring more of the Okanagan outdoors by camping and fishing. Warren is a Field Supervisor for the Oliver, Osoyoos and Similkameen areas. Warren and his wife recently moved to the Okanagan from Alberta, and fell in love with the area. It was in 2015 that he first read about the SIR Program and was so intrigued, he told himself that when they relocated he would apply for a job with us – and he was hired! He is excited to be on the SIR team! Born and raised on a farm, Warren has always had a love for agriculture, the environment, and working outdoors. In his personal time, he loves to play golf and intends to scout the lakes in the area for trout. He looks forward to this new adventure – meeting new people and learning new things to contribute to the success of the program. Michelle manages specialty projects at the office, including the BC Decision Aid System (BC DAS) and helps keep the field program running safely as the acting safety coordinator. Scott began working for the SIR Program in 2002 . He is responsible for the safe and reliable operation of the SIR Program’s world class Mass Codling Moth Rearing Insectary in Osoyoos. Scott is always looking to produce the highest quality insects through the most efficient means possible. Through mass rearing and sterilization of adult moths using gamma radiation at the Osoyoos BC facility, Scott and his team are capable of producing up to 2 million sterilized moths per day. In his free time Scott enjoy camping, gardening and travel with my wife and family. 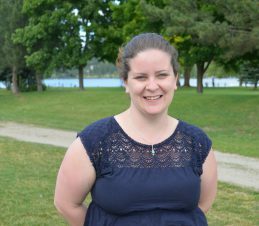 Leanne started her SIR career as a field supervisor in Kelowna in 2015. 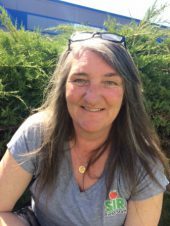 She changed positions at the end of 2015 to become the afternoon Rearing Supervisor at the SIR codling moth facility in Osoyoos. Her main job is irradiating the moths in the evening for the field staff to take in the morning to release in the orchards. She takes pride knowing that she part of the team that helps raise high quality codling moths for the Okanagan growers. In her free time Leanne enjoys off-roading and exploring the Okanagan outdoors. Mary Anne has worked at the SIR rearing facility since 1999. As Quality Control Lab Supervisor she is responsible for monitoring the health of the codling moth colony from egg to adult stage. Mary Anne has a technician diploma in biological sciences from B.C.I.T. Before working for SIR, Mary Anne worked as a supervisor of quality control at a silviculture nursery for nine years. Mary Anne’s routine quality control tests and continuous team work with all SIR employees ensures the production of healthy moths. When away from work Mary Anne enjoys working in her garden at home. 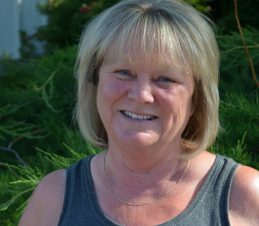 Originally from the lower mainland, Joanne’s family would summer in Osoyoos every year enjoying the fruit and the weather. In the early 90s they moved to the area. In 1995 Joanne began working as a rearing technician at the facility. She was amazed to find so many workers who had the same passion and interested in the program as she did. Joanne became Senior Rearing Supervisor a few years later. Her duties include monitoring the colony, organizing daily activities, and ensuring sanitation procedures are met. A lot has changed over the years, but Joanne says “it’s great to work with so many others who share the same commitment and passion.” Joanne enjoys spending time with my family, her dogs and golfing when she is not at work.